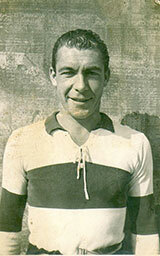 Unfortunate to have his playing days coincide with the Second World War, Luigi Bossi played as fullback in two tests for Italy before being called for active duty. As a university student, he was assigned as captain of 300 men in Sicily as Allied troops arrived, filming the landing on one of the first "portable" film cameras before it was sadly requisitioned. Following capture by Australian troops and a brief stint in Africa where he contracted malaria, Luigi Bossi spent the final two years of the war in a prisoner of war camp in Cambridge, England - his time there eased after he was recognised as an international rugby player.